Everyone has seen a spoiler but what does a front splitter do? 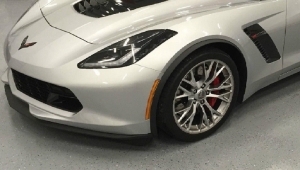 The front splitter helps control the airflow in front of the vehicle so that it has less lift off the ground. The fact that it stays on the ground increases the traction the vehicle has on the ground. It is a really simple explanation but the end result is that the front splitter can and does make the car faster because the control of the airflow in and around the vehicle. What is the size of this part? The system says that this part weighs 8 lbs and has the following dimensions 72 x 22 x 2. How do you ship this part? What service do you use to send it to customers? 22922352, a front spoiler stage 1 splitter, tends to leave the store via FedEx home delivery. You can request another service type but the buyer picks up any extra incurred shipping charges for that choice. Does the part come in a box? Actually yes, it does come in a box. The box is actually quite large as well. Our measurements say it is 3 x 23 x 71 and it weighs around 5 lbs.